An unusual rose bowl or vase in very good condition. There are no Maker's marks. BIAGIOLI GUBBIO. 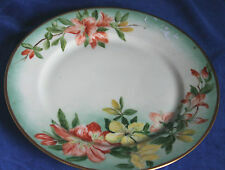 DISH / PLATE. ITALIAN POTTERY. Vintage large Scheurich Keramik West German one handled brown/beige vase/jug in very good condition with no crack, damage, nibbles etc. 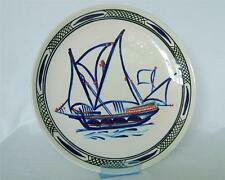 A very nice example of this collectible West German pottery. Colour of the vase is brown and beige and I think a lava pattern. Height of the vase is 14 inches and width 6 inches. Please look at the photos as they form part of the description. 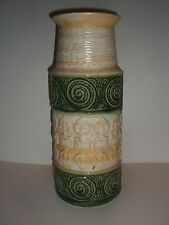 Retro Scheurich Green West German Pottery Vase See More Items. Dispatched with Royal Mail Signed For® 2nd Class. 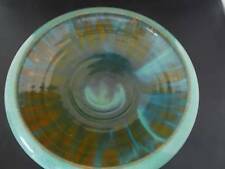 Conical shape with pale yellow and green glazes dripping down over a turquoise coloured glaze. The glaze is gorgeous. Small black stand not included. Unless noted in the condition of the item, any white or light areas are due to reflection and are not part of the item. Large Scheurich Foligna vase with earth tones colourway. LARGE HORSE SCULPTURE MARKED TO THE BASE OF ONE FOOT ITALY. One of the rear legs has been broken in the past and has been glued back on. Despite all of this the piece still displays very well. ITALY c.1960s This is quite an unusual design differing from the regular blue horses, most visually the saddle is not present in this design. Bodo Mans designed vase for Bar Keramik c 1960s 1970s West Germany. This is a Lovely Vintage Peach Coloured Textured Scheurich German Vase marked 580-20. It Measures 8.5inches in Height and has a Slightly Textured Feel. It is in Great Unchipped Condition. 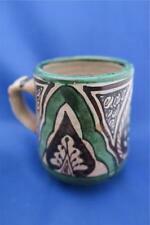 Great sgraffito and vibrant glazed design, mid century Italian art pottery Jug. Jango Swan Planter. This is a realIy beautiful white and gold swan that I have never used. It weighs 480 grams. Sgraffito techniques used, all hand painted. Signed on the base but I can’t identify the maker or pottery. Probably later 20th century, e.g. 1970s or 80s. Condition - very good. SERPENT TWISTS ROUND TOP PART OF VASE. TWO FAINT 2 CM HAIRLINES RIM DOWNWARDS. A FEW GLAZE NIBBLES ON RIM. I have had this small vase for many years hoping to find out who it is by but without success. It looks very much in the style of Ciboure though has an incised mark to the base which I have not identified. A beautiful piece with fantastic detailling, it stands 5 cms high, has a width of 4.75 cms, length of 8.5 cms and is fully back stamped to the base. Marked top the base with "1002/15", denoting the shape and size, and "hand painted" in German. As seen in the photos. Vintage West German Fat Lava ES Keramik pottery Rock vase 673 18. 2 of 2 listed. An unusual West German vase in the form of rock or stone by E S Keramik and dating from the 1960s. Excellent condition with original paper label and just two tiny nibbles to the base as shown. Number 2 of two I have listed. Decorated with a rich honey yellow slip glaze and blues, greens and browns for the bird, I think it’s probably French or maybe Spanish. Signed on the front by the maker. With a freely executed design, this is a good piece of rustic studio art pottery. Signed ALONSO EL PUENTE (T.O), it was probably made in the Toledo region of Spain in the second half of the 20th C. Unusual design, beautifully hand painted and a great example of folk art pottery from the region. He looks a bit like a crow or a rook, or maybe he is just a whimsical bird. The bird is standing by a bowl. This could be used for nuts maybe, or maybe an impressive quirky ashtray. 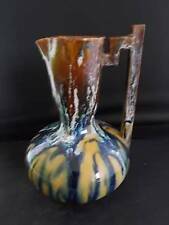 The colourway of the pottery, and the glaze suggests this is a Belgian Pottery piece, with it's blues, orange, and greens. A rare and attractive pottery ewer designed by the artist Spencer Edge and depicting an Art Nouveau maiden with flower in her hand. William Millett Spencer Edge was the son of William Millett Edge and Isabella Fletcher. Spanish Folk Art. High Quality piece In Very Good Condition. A VINTAGE WEST GERMAN 60s JUG/VASE. IT STANDS AT 25 cm HIGH. New listingORANGE & BROWN LAVA POTTERY WALL POCKER - RETRO 60 / 70's - OVAL - W GERMANY ?? Very retro 60's or 70's - no makers marks - possibly West German pottery. Very interesting shape small jug in a retro style. In excellent condition. Body to Handle: 9cm.